1.Prepare farro as label directs; cool and transfer to large bowl. 2.In large skillet, heat 2 tablespoons oil over medium heat. Add Brussels sprouts; cook 8 minutes or until browned, stirring occasionally. Add red onions; cook 3 minutes, stirring frequently. 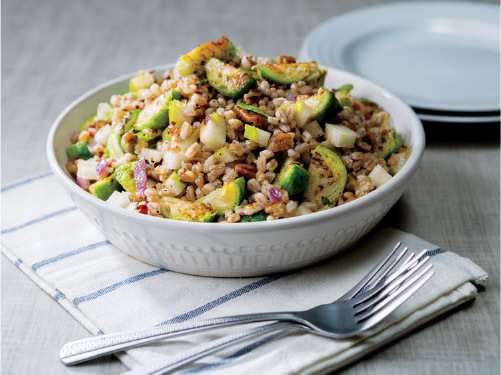 3.Add remaining ingredients, remaining 2 tablespoons oil and Brussels sprouts to farro; toss. Makes about 6 cups. Farro is an ancient grain from the wheat family, so it is NOT gluten free. Pearled farro has been processed to remove the outer covering, which allows for quicker cooking.